A seismic receiver serves as an indicator of environment oscillations around it. The seismic receiver is a vibration-sensitive element with an amplifier normally enclosed into watertight casing. The oscillations of seismic receiver body are transferred to the vibration-sensitive element. Therefore, the seismic receiver should be installed at the measuring location, so that it could transfer the oscillations of environment/structure to the sensor casing. There are different ways to harmonize the impedance values of two environments, when acoustic oscillations or seismic waves cross the border of the two environments. concrete structures – for measuring the vibrations of dams, tall structures, etc. ground – for measuring the ground oscillations caused by seismic and man-made impact. In each case, the sensor installation has certain specifics. Seismic receiver mounting onto metal or concrete surface is very simple. In this case, the density of the sensor body material and the object are similar as well as the acoustic speed within them – the wave does not reflect from interface at comparatively high oscillation frequencies. The installation of sensors in soils ranging from water-bearing to dry sandy ones requires a matching link. In this case, the oscillations are transferred from the environment to the matching link, and from there to the sensor casing. Without the matching link, the enviroment will oscillate, and the sensor will “stand still”. The seismic receiver installation on the ground using the matching link (the added mass) has simple rules: the lower the soil density is, the greater should be the area of added oscillating mass, and dimensions of the intermediate link must be much less that the measured oscillations wavelength. The seismic receiver is directly mounted on the controlled structure with screws and nuts. The signal cable must be securely (so that to exclude vibration) attached to the structure along the entire length without slack and tension. To exclude climate influence on the seismic receiver body, it shall be isolated from environmental impacts (temperature fluctuations, wind, humidity), e.g. by using light external casing filled with heat insulation material. Please note that each frequency has its own oscillations nodes and antinodes. Therefore, to analyze the behavior of the whole structure during the tests, the measurements must be carried out at several points simultaneously. For the purpose of concrete structures oscillations research, the analysis shall be performed at lower frequencies. The mounting methods are the same as for installation on metal surfaces, given that the screws can be tested. Alternatively, the seismic receivers can be glued with further heat- and damp-proofing with bitumen. To learn that, it is necessary to perform monitoring in three directions at different heights. For parallel measurements in three axes simultaneously, it is convenient to use triaxial sensors, such as BC 1313. For monitoring the integrity of pipelines under seismic impacts, the sensors are installed directly onto the pipe using clamps or epoxy compounds with isolation and sealing. ZETCORR mobile leak detectors utilize BC 121 sensors, which have rectangular magnets on the base for fast and secure attachment to the pipe. When installing the sensors on the ground for monitoring seismic condition of the area, the impedances of two environments must be matched. 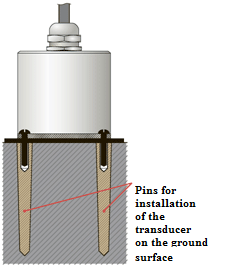 This involves mounting of seismic receiver onto the slab with further installation on the ground (see figure above). Also, the seismic receivers can be installed on the ground using legs (pins) screwed to the sensor base (sensor flange has mounting holes). When installing the seismic receivers into the ground, the sensor should be put into the hole, and then the soil is densed. Installation depth – until firm soil or permafrost. The groundwater does not affect the seismic receivers if they are water-proof. When installing in the soil, it is important to place the sensor into an area without water current.